For information about the jam, or to be placed on the mailing list, contact Paul Spafford at paul@mandolinpaul.com. The Folk-along Tuesday jams continue at the Vimy Brewing Company (145 Loretta Ave. N.) for the foreseeable future. The Spirit of Rasputin’s Folk-along Jam has had a number of homes over the past few years. First The Georgetown, then Elmdale Tavern, then the Xpresso Café, then back at The Georgetown, and the Montgomery Legion. Now it has found a home at the Vimy Brewing Company. The jam starts at 7:00 pm and goes until about 10:00. It is an acoustic open jam, where musicians sit in a circle and take turns leading songs of their choice. 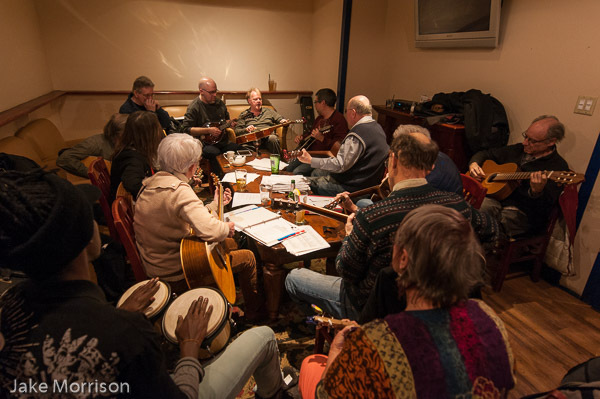 While the jam sessions are not structured as a performance per se, everyone is always welcome to come and listen in, or join in the circle to play or sing. If you’d like to lead a song everyone might not know, or one of your own, chord sheets come in handy.